Aug. 10, 2015, 3:15 p.m.
Risk of Change: Mostly no, some wee details yes. I have a strong fascination with human ancestry and the migration of bloodlines. Not crossing the Atlantic to colonize America or anything like that, but much before that. I’m talking the human migration across the globe out of Africa. The seven daughters of eve. That sort of thing. The broad spectrum of cultures and ethnicities that formed as we dominated the globe are therefore a primary source of inspiration for me–peoples’ architecture, language, art, philosophy, religion, regime, and technology. I realized years ago that I was thinking much too small with my world. It was once a Pangaea with a few islands, but my brain comprehended the scale of the land as more like a continent. I added a second continent, and then a third and a fourth, and since, their shapes has shifted and the country and culture layout has changed dramatically as I struggled to grasp the scale that I was truly dealing with. It was a planet, not a collection of rpg maps, after all. I also realized years ago that, for being another planet entirely, it was strange that humans were present. So were various other animals from Earth. “Maybe Noah’s arc was a spaceship and this is where they or a portion of their cargo unloaded to colonize.” …Myriad cliche sci-fi related answers crossed my mind, but eventually, I decided to manage it as typical fantasy realms do and leave that unanswered. However, it wasn’t good enough. I wanted a realistic Earth-like appeal. All races evolved as they did on earth. Humans evolved in the same way as real humans did, from the same (or similar) line of species. Genetically, the realm’s genetic journey took a very similar route to Earth’s overall, but with room for a plethora of species customization. 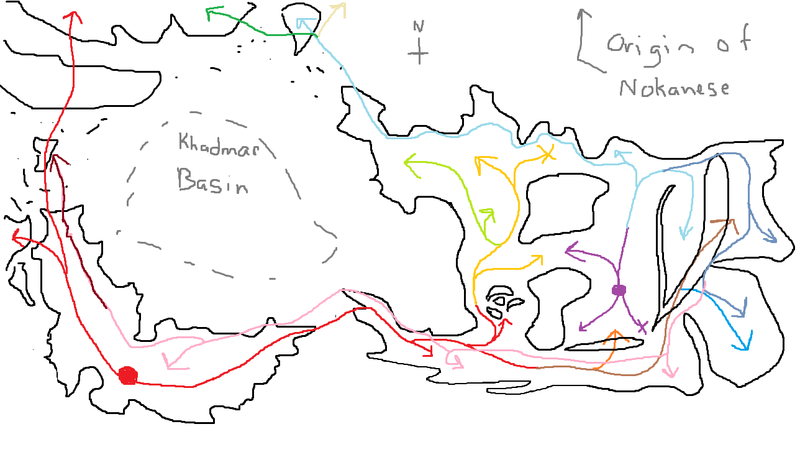 Both trolls and humans have a migration path, taking them across land bridges, shallow gulfs and bays, and many, many biomes. This lead to a plethora of ethnicities and the birth of many different societies with methods of survival based on their environment. Many human ethnicities do mirror those of Earth, but there are also variants customized by me. One of my points of inspiration is the villain in the first Conan movie (with Arnold as Conan.) The person in charge of designing his character said that he intended the character to look ‘like he is the last of a race of people that are now gone’ and described how he had a facial structure of african genetic resemblance, his black hair however was straight and of a fine unkinky nature. His skin was paler and his eyes were a blue–he embodied ethnic building blocks put together in a way we are unfamiliar, and it shows. There are still ethnicities being developed with that sort of method in mind, the looks explained by cross breeding over time, environmental factors, or selective breeding based on what is culturally considered beautiful. Troll and Nokanese ethnicities are one big toy box for me to play with. There are lesser trolls, trolls, and ogres based off Finnish/Swedish/Danish/Norwegian/etc mythologies, some based off of popular troll tropes in fantasy in general, and the rest are mine, all mine, to design. I’m doing the same thing with entire cultures, swapping around the building blocks. I’m not taking any real life cultures and employing them as carbon copies in my world, however, like common ‘this is fantasy, this is a race of white people, they must live in castles and medieval hamlets’ tropes. I’m taking extensive pains to make every detail of their societies/cultures unique, while maintaining enough features that they are received as relatable. I’ll do a culture series for ones that I’ve put the most effort into in the vaults of lore project later. Have to quit writing and get ready for work soon, so I’ll stop here and leave you with a shoddy scan of a migratory map of the southern contenints that I flash drew awhile back. It’s just an example and all I’ll say is that the big red dot is where trolls migrated out from as a racial origin point (like our Africa) and the purple dot is the human origin. Every time the color of the line changes, it shows where a different ethnicity was born. If the line ends in an X, the genetic line is extinct.